To live up to our Garrison Motto, raise some funds for the Queensland Cancer Council, and have a tonne of fun! Not only did we raise money for charity, we had fun, and we made a lot of people smile. 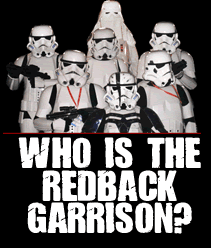 Be proud of yourselves, Redbacks. We ROCKED Supanova! This entry was posted on Monday, April 4th, 2011 at 2:21 pm	and is filed under Uncategorized. You can follow any responses to this entry through the RSS 2.0 feed. Both comments and pings are currently closed.